The Dodgers arrived in Vero and were welcomed by Mayor Barber and Chamber of Commerce President William C. Wodtke. Radio station WIRA carried the festivities live. For the two exhibition games, Durocher and his wife, actress Laraine Day, had been assigned one of the barrack’s finest “suites,” but Day found it more than wanting and moved them to the beachfront hotel, the Windswept, five miles away from Dodgertown. Complementing the lack of heating and air conditioning in the two wooden barracks, each standing two stories high on stilts, were the paper-thin walls. Neither bats nor cleats were permitted inside — bats for obvious reasons and cleats because they would ruin the floors. For most of the players, they would sleep six in a room. “It was a lot like the army,” said Danny Ozark, a former minor league player and later a Dodger coach.Ibid. 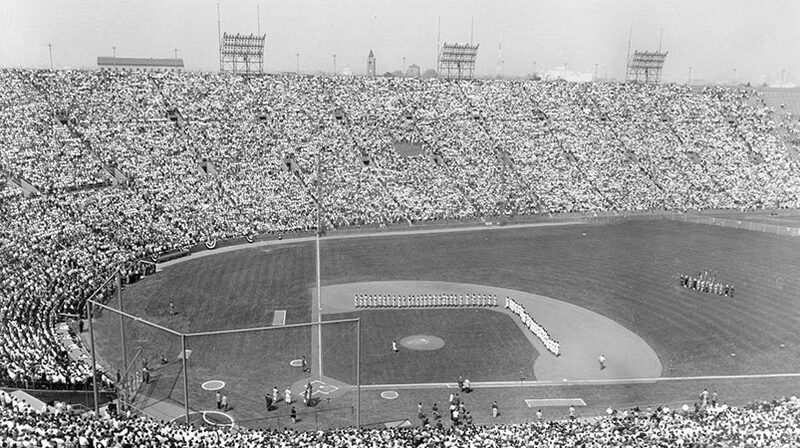 With all the pomp and circumstance for their first exhibition game, the Dodgers defeated Montreal, 5-4, as Jackie Robinson homered in the first inning. Florida Governor Millard Caldwell threw the ceremonial first pitch at so-called “Ebbets Field No. 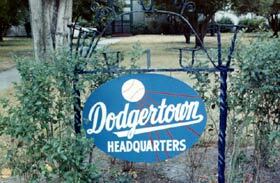 2.” A sign reading “You Are Now Entering Dodgertown” welcomed a strong showing of some 6,000 fans, paying $1.25 in the grandstands and bolstered the idea of more games being played on base in the future. Baseball Commissioner Happy Chandler, who had suspended Manager Durocher one year earlier, shook hands with “The Lip” and wished him good luck. So intrigued by the new facilities was Life magazine that it made Dodgertown the April 5, 1948 cover story and devoted four more pages inside. 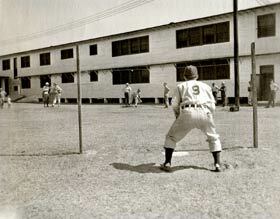 Isolated from the downtown Vero Beach area, Dodgertown enabled the players to be self-contained in the airport area and at the living quarters on base. The Dodgers built up the base so that a player would have all of his basic needs cared for, including their own postal station, canteen, barber shop, Western Union office and lounge. 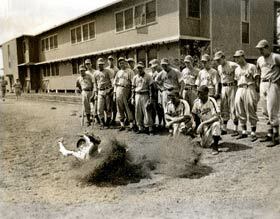 For the 1948-50 seasons, the Dodgers made the best of the camp as more than 600 players each year ran, ate, slept and played games at Dodgertown. Rickey pushed the players up the ladder with the abundant minor league teams. The cream would rise to the top and every player was graded by coaches and scouts in a host of activities held throughout the day. Versatile Herman Levy, the camp mailman and night watchman, who early each morning would run the American flag up the pole and audibly state the Pledge of Allegiance, blew a shrill whistle that virtually got players jumping from their beds by 6 a.m. Classes were held to teach the nuances of the game — baserunning, pitching, hitting, fielding, positioning and training techniques. A pitching area known as “The Strings” was established enabling up to six pitchers to warm up and get their practice work done simultaneously. The strings were held on poles in front of the catcher to simulate a strike zone. As the thrown ball passed through the open space of the strings, the pitcher, catcher and coaches could instantly gauge the result, ball or strike. Pitching machines never tired of throwing strikes to batters in fenced off areas. Several sliding pits with sawdust and a base were created. Regular size and half fields were used for practice purposes. A giant brick wall was erected for fielders and pitchers to utilize. Dodgertown and Vero Beach, FL are synonymous now. But, in the early years, the Dodgers struggled to draw fans to the complex to watch games. In fact, the majority of Dodger spring training exhibition games were played in Miami. The innovative pitching “strings” area, which outlines the strike zone, helps pitchers to pinpoint their control. One of the many training areas at Dodgertown includes the sliding pits, with their sawdust and base.